I stuck the "house" into a stack of firewood I plan not to touch this year, we'll see what happens. In general what they need is for the tubes, whatever they are made out of, to have one sealed end and no cracks or splits along their length. Leaf-cutter bees, that normally come out a bit later in the year, are less bothered by that but for mason bees its pretty well a must. The holes should be no more than 12mm wide, there are some really tiny species that like really small holes but I think around 12mm is the max. They should also be no shorter than 10cm, ideally between 20cm and 40cm. It should also be somewhere sunny, the pore little things don't have a hive of sisters to keep them warm so they need some morning sun to warm them up. It is quite easy to make a nesting box though. Just cut up some bamboo canes just above the node so you end up with a bunch of tubes with one end sealed by the node, tie them in a bundle and stick them under the eves of a shed or something. You can do the same with any hollow plant stem like cowparsley. Or just drill holes in a lump of wood. The main thing as always though is to listen to the bees. 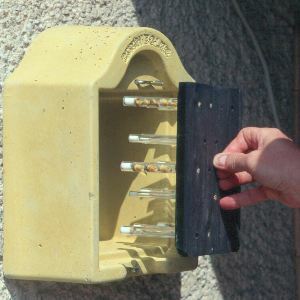 Look at the old pipes they have chosen and try to see what your bees are looking for in a home first and then replicate that. Good luck with them, they are really interesting creatures and the more pollinators of all kinds we have around the better. P.S. Here's a pick of a nesting block I made for my grandparents a couple of years ago. You can see some of the cowparsley stems at the top have been filled by mason bees while the slightly split wood at the bottom has been used by Leaf-cutter bees. 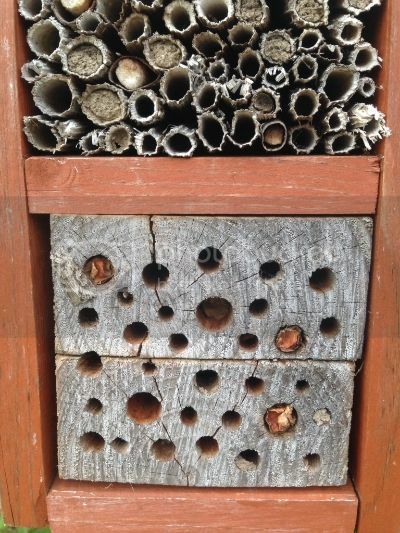 You can get some mason bee houses with glass tubes, so you can observe the bees when building their nest, see the larvae when the eggs hatch and so on. Most interesting, you have an observation "hive". Thanks for the reminder. I've been meaning to try making a block, but with many more different sized holes. Start with 3/8 inch, then 5/16, followed by 1/4, 1/8, and 1/16 inch. Apparently in our area the 1/16 inch holes will fill first as some of our tiny solitary bees emerge first. Those tiny little girls do a great job on the strawberries and cherries. when you use blocks, do you clean them, or are they self-servicing? I recall seeing videos even refrigerating the bees for the winter and cleaning huge "hotels"
I'm not sure your post was directed at me, but I've not tried yet. I know you can buy straws for the hotels, pull the straws out when full, and replace with fresh straws. The idea behind putting the straws and cocoons in the refrigerator is that you can take a few out at a time (next year) and spread the emergence out and have a longer pollination period. The straws are all the same size so you get one species. I think it would be better to provide a variety of homes and therefore a variety of species and let them emerge on their own time table (not my original thought by-the-way). I don't know when to clean out the blocks because some of them will over winter as adults and others as cocoons.